Between working the kids, 2 airplane rides, and that temperature drop from Florida to Chicago that I would end up with a cold. And now, my cold has escalated into a lovely sinus infection. I spent Wednesday night getting cozy with the Kleenex boy, sipping my green tea, and dressed in my favorite flannel jamies. ‘Flannel…’, the BOY said. ‘You must not be feeling well.’ He knows me so well. The saddest part about this illness, besides the fact that I get cranky when I don’t feel well, is that I have less than a week before I go back to work and big things planned. For example, Date Night at Joe’s downtown. The BOY and I have been looking forward to this night for 2 months since I made the reservation. Since I wasn’t feeling great, we made a few modifications, heading into the city a little later yesterday so that I could rest. We took the train downtown and checked into our hotel room. The streets were wet from a light snowfall, so my pictures picked up the glare. But, I wanted to share the beautiful city lights and decorations. The weather was mild, so I convinced the BOY that we should walk. Our first stop was POP’S for Champagne. We were so excited for dinner that we arrived at Joe’s early. Neither of us has ever eaten at Joe’s and it has been on our bucket list for awhile. We were not disappointed. Our meal was incredible! We had sea scallops for an appetizer and shared a mushroom mac n cheese with the main dish, some many-day-aged steak for the BOY and sea bass for me! I packed a pocket full of tissues and made it through the dinner despite my stuffed up sinuses. We had some plans to meet friends for a drink after dinner, but by 10:30pm, my head was heavy and I was ready for bed. It was another fantastic night in the city, and I gladly collapsed into the soft, fluffy bed! We woke up this morning to find big snow flakes swirling right outside our window. We braved the cold and made our way to Michigan Avenue for breakfast (and a quick trip to the GAP) before heading home to the suburbs. Where I have changed back into my flannel and permanently attached myself to the couch. I am on Day 2 of an antibiotic and hoping that this feeling worse is what needs to happen before I am feeling better. 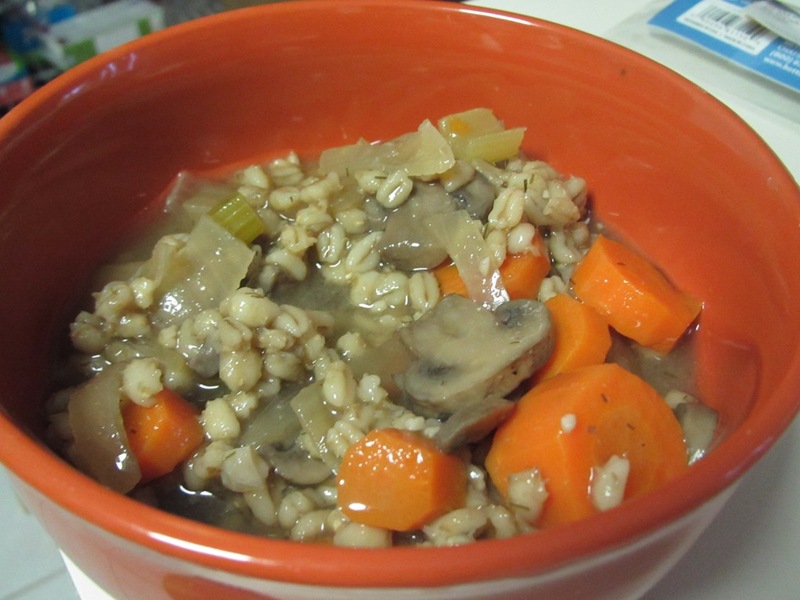 I had some homemade Mushroom Barley Soup for lunch. The BOY and I watched Rock of Ages (he was just as happy to lay low today as I was), and now I am moving on to a Law&Order marathon before the Indiana Basketball game tonight. So does looking at these adorable little cake balls (you may have seen them on my Christmas post) made by my close friend A! She is so amazing, talented, and creative, and these taste just as good as they look. Next time she is in town, I definitely want a decorating lesson! Hopefully tomorrow I won’t be blogging but will instead be out and about, detached from my Kleenex box, enjoying the last weekend of the year! Optimism should work as medicine, right? How I love the city this time of year! Glad to hear you we’re able to make it there and enjoy the evening. Such cute pics! Feel better soon! I was hit with a nasty cold over the past few days. I’m just getting back to normal. Thank goodness! I crave normal right now : ) I am attached to my kleenex boy and have been wiping everything down with Clorax wipes…yuck! This is definitely that bad time of year for colds and I am eager for my Zpack to kick in! That being said, I did still enjoy our night in the city and loved seeing the skyline all lit up. Every time we’re down there, we just want to move to the city! I’ll have to find for you on one of our first pictures 6 years ago. I think I posted in in August! Add it to your MUST VISIT list for sure! We always have a nice time when we go. Sinus infections really are the worst and as annoyed as I am about being sick, it’s been a pretty healthy year so I can’t complain that much. Thank you, Thank you , Thank you! I am hoping to brings my big recovery becasue I am pretty sick of being sick (although I am still digging L&O). Ha ha! Oh, no! Rest up, and feel better, dear! I hope you feel 100% better soon! Getting the holiday sickies is no fun, but with all that traveling, it’s inevitable. And your dinner sounds soooo good, by the way. Glad you still made it out for a date night! Oh noo!! EVERYONE is getting this nasty cold. I am finally getting over mine. I hate being sick more than most anything. Get well soon!! You’re awesome for going out while sick! It was worth the rally! We loved it being downtown but I was definitely in bed earlier than usual : ) Glad you are feeling better! I hope you are feeling better very soon! It is horrible to be sick. At least you were still able to enjoy your special dinner. Did you like Rock of Ages? I was pleasantly surprised by it. Oh you poor thing!! Saltines always make me feel better. I LOVE Chicago so so much. It’s so beautiful there. I’ve never been there in the winter! Stay warm and get better! I’m working on it. I seriously only eat saltines when I am sick as they lack much nutritional value but my big plan is to make some toffee with them when I’m feeling better : ) Although many are afraid to do it, I say bundle up and visit Chicago in the winter. The city is beautiful blanketed with snow and has an entising holiday spirit! What a bummer you were sick, but it seems lie you’re better and baking again, so that’s good. Those cake pops are adorable. Your friend is talented. I am feeling well enough to get moving and hoping to finally get in a workout tomorrow. It’s amazing how long these colds can hang on! She really is incredible! I can’t wait to see what else comes up with!